Ever since learning about the Texas-sized garbage patch in the Pacific a couple of years ago, I have been a bit paranoid about how much plastic and other trash we all contribute to it. Life without plastic may seem impossible, yet there are people and websites that offer alternatives. So, as little as this effort is, for the past 2 years (after I first bought my favorite shopping tote made from recycled plastic bottles at Trader Joe's - $1), I'm happy to say that both my husband and I have greatly reduced our need for grocery store plastic bags. We now have 3 such shopping totes which have been used on EVERY food shopping trip to the store. And we always try to buy food stored in glass containers and loose vegetables instead of using those thin plastic bags to separate them from the rest of the food items in our cart. We pile it all together in our Trader Joe's bags (mushrooms, scallions, apples, bananas, zucchini etc) and sometimes we put the parsley bunch on top to make it picture-perfect - so proud that we told eager bag-people "No, thanks. We'd like to use OUR bags!". Yes, this is a miniature effort on our side, yet we feel infinitely happy about it (and, let's face it, a bit condescending, too). Yet, somehow, there are still several plastic bags around our place. Sure, we can easily toss them and maybe (but most probably not) think how they'll float from ocean to ocean and choke seals along the way... or we can try to find a way to re-use them .. maybe as an object of art. Helle Jorgensen is a wonderful artist, and she also had a similar scare!! Knowing that plastic debris kills marine life, she asked people to send her their used plastic bags. She uses these bags to transform them into plastic yarn. 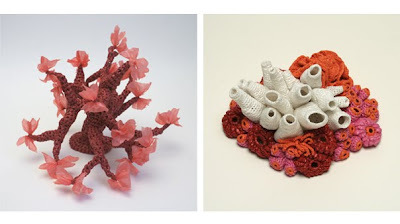 Out of this plastic yarn she then knits sea creatures - and such wonderful sea creatures - it's absolutely amazing!! 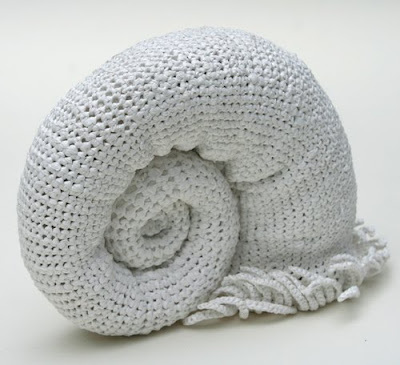 See her blog here, and her sea creatures gallery here. She is such an inspiration!!! thaks for this Marija, I love this! i posted to my FB - this HAS to be shared! what a great find!